Pans for plenty of good food! Whether you are baking cookies, biscuits, petit fours, or cakes to roll, this Large Nonstick Jelly Roll Pans and Rack Set is the perfect accessory to complete the job in your kitchen. High quality construction in this Chicago Metallic set prevents warping and popping when heated in the oven. The non stick surface makes food slide easily out of the pans and makes clean up quick. The cooling rack has feet to raise it off the countertop so that air circulates around the food as it cools. These pan trays will handle a large amount of food for your family or for company. 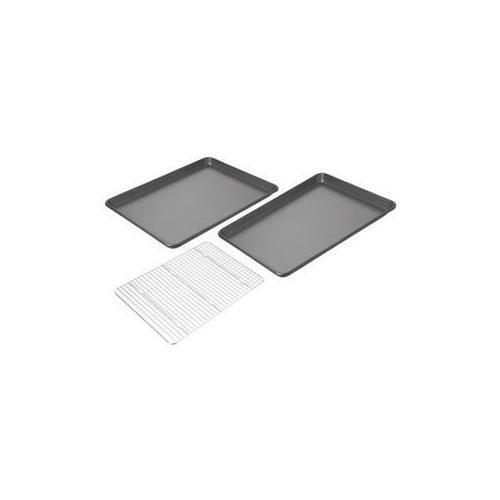 Jelly roll pan size Provides larger cooking surface than a regular size cookie sheet pan. Lip pan edges Prevent dripping of juices over the edge of bakeware. Cooling rack Is larger sized to fit jelly roll pans and to cool larger quantities of food.